The six hottest Julys in the US were 1936, 1934, 1901 1930, 1980 and 1954. 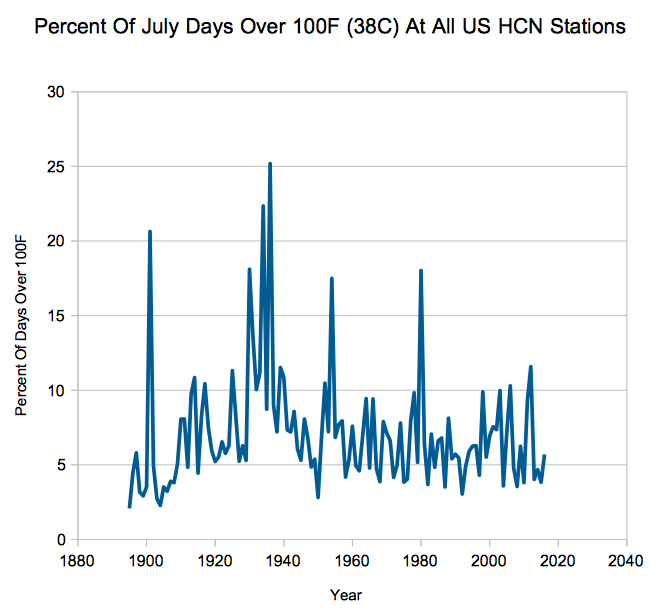 The frequency of hot July afternoons has plummeted over the past 80 years. Experts say that hot days are increasing, because they are paid to lie. What our friends on the left are doing is controlling the metric that is used to describe extreme weather. The experts you allude to use the daily average temperature to construct their narrative. What you are doing is breaking ranks using the daily high to describe hot days. When Johnny Carson said “Today was a scorcher!” and Ed McMahon asked, “How hot was it?” Johnny didn’t reply with the average temperature for the day. Using the average temperature when the high and low for the day are known, isn’t merely stupid, it’s dishonest. You can bet that if the maximum temperatures did show an increase over time, that would be reported. Yes, as you say, “… they are paid to lie.” And the lie is reporting the average as if it were the extreme. And that is further extrapolated into claiming the weather is becoming more extreme when the opposite is true. Even the “tamperatures” (I like that term.) used by NOAA’s Climate at a Glance show that the Minimums are getting warmer and the Maximums are getting cooler. Climate Change if there is any is bringing mild weather. And now you report that a similar situation exists in Australia.